When Chairman Tim Bergeron started Adaptivemall.com in 1998, the notion of actually earning a profit doing e-commerce was a mere gleam in some futurists’ eyes. Amazon had opened its doors only two years earlier, and was losing money hand over fist. Even Bergeron’s kids had their doubts. Which is how, with Aabaco’s help, Adaptivemall.com became the first online web site selling special needs equipment for children directly to families. Today, 18 years later, with a staff of 10, Adaptivemall.com still offers the best selection of adaptive equipment on the internet. Their products range from special needs strollers to special needs car seats to toys for children’s therapy. And just as their motto says, they really do understand. Carrie Bergeron, Katie’s little sister, was born with Down syndrome in 1976. Unless you have a family member with Down syndrome, Cerebral palsy, or some other developmental disability, you may have only a vague idea of what adaptive equipment is. The term refers to products that are made specifically for children with different types of disabilities. Adaptivemall.com tends to focus on children with gross motor disabilities, like kids who can’t sit up on their own, or walk, or ride a bike. The site sells a variety of equipment that will help them be more independent in performing these tasks. Tim and the Bergeron/Peglow families have devoted a major part of their lives to designing, building and selling adaptive equipment. Long before he started Adaptivemall.com, Tim was an industrial designer creating and manufacturing “cushion technology” products for children with special needs—huge rolls, balls, and wedges made of soft foam in vibrant colors enjoyed by parents and therapists alike. They are still found in Physical Therapy Departments across the nation. In 2001, a few years after Adaptivemall.com made its appearance, Tim launched another company, Special Tomato, based on an advanced reinvention of cushion technology that improved upon his earlier creation. Another benefit of Special Tomato’s proprietary cushion technology is that it allows for curves, creating a contoured surface that mimics the shape of the human body. This is important for children that have limited mobility. It’s no surprise, then, that several Special Tomato products are best-sellers on Adaptivemall.com. 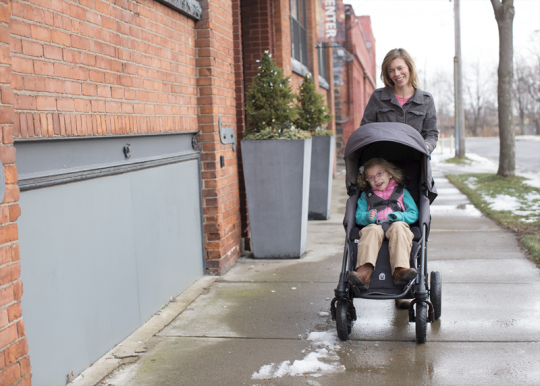 One popular favorite is the EIO Push Chair, an extra-wide baby stroller designed to accommodate a taller child comfortably. By three and four, most children with special needs have outgrown the “typically developing” stroller, but the family still needs something to take a quick outing in town – something easier to use than a wheelchair. Special Tomato’s Soft-Touch Sitters are also best-sellers. With close to 10,000 products and accessories to track, and a huge amount of need-specific information to navigate, Adaptivemall.com’s web site is the linchpin of the operation. And for almost 20 years it’s counted on Aabaco Small Business (formerly Yahoo Small Business) to keep it running. “Our biggest challenge as a startup was navigating the ever-changing internet to stay at the forefront,” Katie declares. “To be high in the top searches, to understand how to develop our site, how to present our products effectively. Tim has no background in computer coding, and neither do I. Like most ecommerce businesses, Adaptivemall.com uses social media and a variety of other marketing methodologies to attract customers—but even more important is the unique customer service that keeps those customers coming back. Adaptivemall.com puts licensed Occupational or Physical Therapists, including Katie, on their Customer Service staff. 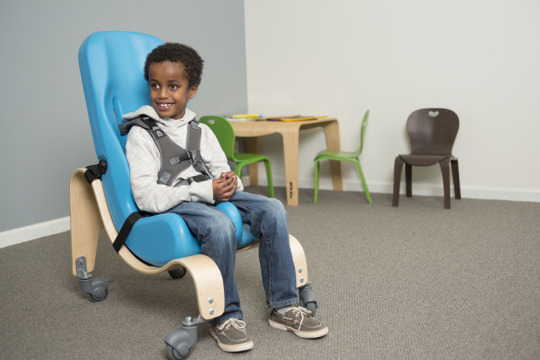 The therapists are there to provide assistance for families in choosing the most appropriate equipment for their child. In addition, therapists write the descriptions for each product, to ensure that the therapeutic benefits of each device are explained. Ask Katie what the company’s greatest triumph was, and her voice softens.